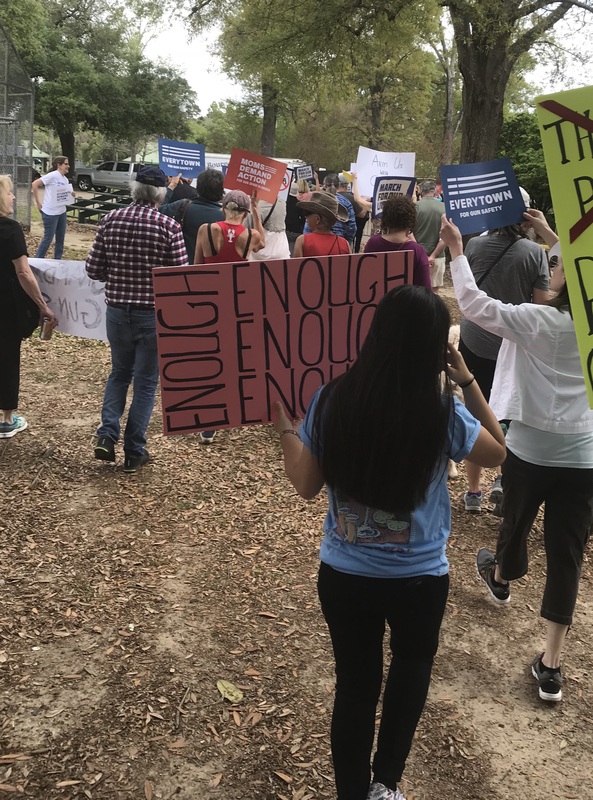 Yesterday I joined March for our Lives in Lafayette, LA. It did not even come close to the numbers marching in other places. I would estimate 200 or so people. 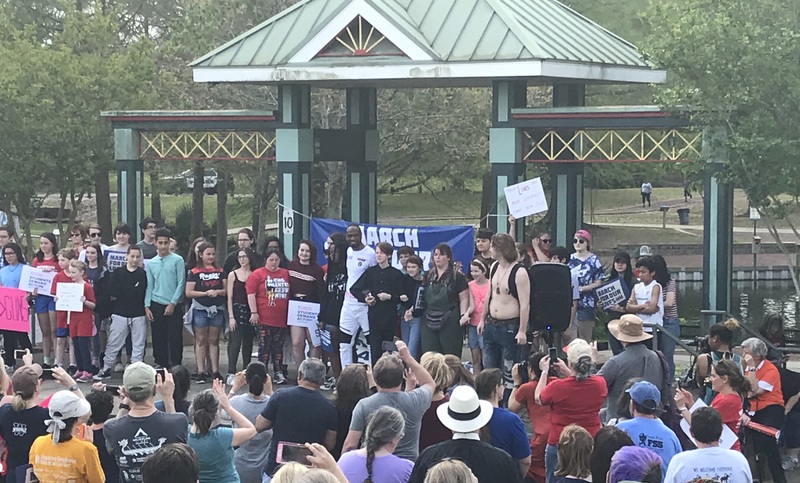 The message was clear, and the march was a peaceful walk around the park. We chatted with people we knew. We cheered for the kids who bravely stood and spoke on stage. The violence of our times is unacceptable. My faith tells me that the answer is love. Not everyone is going to accept me. I need to accept this. As I watched the video of kids speaking in DC and beyond, Emma Gonzales, Naomi Wadler, and Georgia VanDerwater, I was moved to tears. How could I be afraid when these kids were so brave? As a teacher, I am afraid to stay quiet. I cannot stand by and watch young children frisked with a metal detector. I cannot stand by and accept teachers being armed. These actions are band-aids to a problem our politicians are afraid to address, gun regulations and the lack of mental health care. Band-aids are being placed on a broken system, a system with empty counselors’ offices, a system without adequate response to children in trauma, a system stripped of the arts. Long term solutions are available if we are only willing to fight for them. I will carry a sign. I will not carry a gun. Beautiful post. Thank you for marching. I couldn’t make it to our march, but wanted to! I loved that advice from Naomi Shihab Nye on the On Being podcast – three lines a day. And your lines are exquisite. The practice of writing three lines a day seems so doable to me to capture the moments we experience in our day. You captured your moment and your feelings quite clearly with your three lines. I agree…let’s fix the broken system. These band-aid solutions only lead to many, “I told you so,” comments down the line. Let’s actually fix this. Beautiful poetic prose — I share many of your feelings. Your three lines leave me with a lot to ponder. I also plan to listen to that podcast – thank you. Margaret, I couldn’t agree more. “I will carry a sign. I will not carry a gun.” The answer to the problem of one gun, isn’t really two guns, is it. I marched. I cried. I couldn’t utter a word, the movement grabbed me that much. I’m glad you marched too. I am going to try those 3 lines a day. I too marched – it was such an emotional and draining day! I sliced about it – but that was difficult too! But I love your last line – I will carry a sign and not a gun. Must check out the podcast and consider writing three lines a day! I marched, too. My emotions swung from smiles and elation to tears and sadness. It was such a powerful day. “I will carry a sign. I will not carry a gun.” Perfect. I also noticed this: “Band-aids are being placed on a broken system, a system with empty counselors’ offices, a system without adequate response to children in trauma, a system stripped of the arts.” And my heart replied, “Yes.” We need to protect our children in so many ways – and the physical protection that some people think is afforded by a gun (I respectfully disagree) is, in my mind, a sign that our society has not adequately protected the child as a human. We need so much that is so different than guns. So I will carry a sign – figuratively and literally. No truer statement, Margaret: “Long term solutions are available if we are only willing to fight for them.” Band-Aids will get us no where, and the violence will continue. I wonder if there has ever been a time in history when the solution to violence was more violence? I am so glad you went and so glad you wrote your three beautiful lines. Beautiful, Margaret. I’m still in search of words even though I have filled several pages . . . they aren’t the words I want. Words of hope . . . because of the Parkland students. Words of dreams . . . MLK’s granddaughter. Words of songe . . . Linn Manuel. So much and yet those who say kids should just stop being bullies. Really? I want to address the disconnect . . . This is such a difficult topic. We think they should just know that the measures do not connect to the root of the problem. Why can’t they see the stupidity of arming teachers? It’s hard to find the words. Margaret, thanks for sharing your experience marching. Like so many others, I, too, feel the determination and power of your final lines. “I will carry a sign. I will not carry a gun.” How amazing that teachers even need to make that statement! It was certainly a day I will never forget. I watched every minute on television and cried and cheered. I’m praying that this means the tide is turning and real change will come. Thank you for sharing your experience. It sounds life changing! Thanks, Amy. I was so impressed by Georgia’s speech. You must be glowing with pride! Like you, I am willing to carry a sign, but totally unwilling to carry a gun. And like you, I marched yesterday. The march in Denver was huge, though, they are estimating over 100,000 people. I keep reading about Naomi Shihab Nye’s podcast. This week I am on vacation and will have some time to listen to it. . Your lines are absolutely beautiful- big, big truth in just a few words. Thank you for your resounding post! Thank you for your voice calling for change! Thank you for joining this March Movement! Love your last line. Yes. I will carry many things. I will carry students, signs—never a gun. Cecily and I marched in Hartford, along with many people from Sandy Hook. Such important messages. We can’t stay quiet.